"An outstanding collection of papers many of us have been waiting for. Edna O’Shaughnessy is one of the most penetrating and original psychoanalysts today. These impressive papers offer the reader much interest, pleasure and understanding. 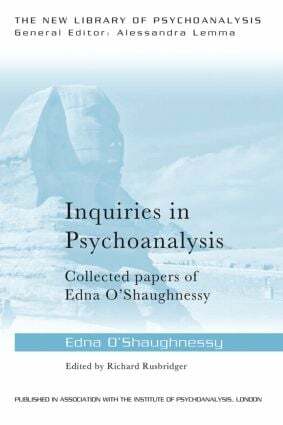 They reflect O’Shaughnessy’s clinical sensitivity, careful and accurate observations, and the profound quality of her thinking." - Michael Feldman, Psychoanalyst, Chair, Melanie Klein Trust. "One of our deepest needs is to understand truly that we are truly understood. The drama begins in infancy; at stake is the possibility of a mind. On occasion we encounter an author whose insight into this fragile dialectic is extraordinary, but who is also so in touch with her reader that she can take us along. Such is the mastery of Edna O'Shaughnessy's psychoanalytical writings. This book is itself an opportunity for understanding and for being understood." - Jonathan Lear, Psychoanalyst, John U. Nef Distinguished Service Professor at the Committee on Social Thought and Professor of Philosophy at the University of Chicago. Edna O’Shaughnessy is a Distinguished Fellow of the British Psychoanalytical Society and a training and supervising analyst for adults and children. She is also a supervisor in the Adult Department of the Tavistock Clinic as well as in the Child and Family Department.